IBM High Performance Services quickly and economically helps meet new and peak demands for High Performance Computing (HPC). 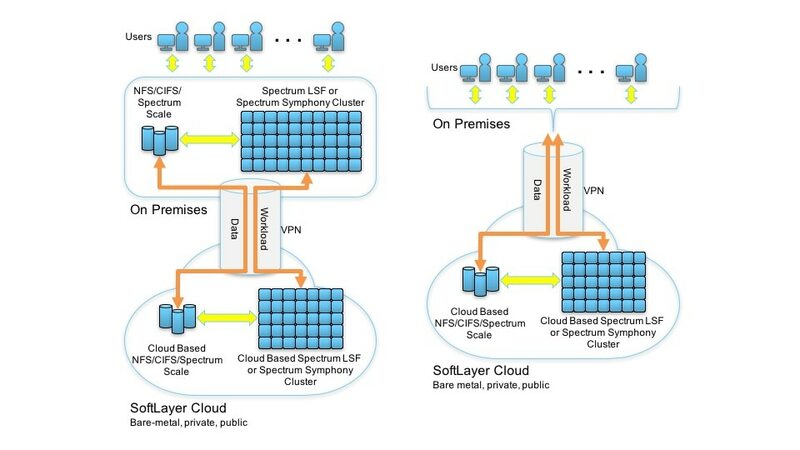 It does this using IBM Spectrum LSF, IBM Spectrum Symphony and IBM Spectrum Scale as a service in the IBM Cloud. Fully functioning and ready-to-use hybrid and stand-alone clusters are securely connected to your on-premises cluster. It includes automatic job transfer and control for seamless workload management. A dedicated Cloud Operations team delivers design, installation, configuration and 24-hour support. Engineers and researches can focus on work – not IT. Improve time to results and faster time to market with real HPC infrastructure – along with IBM Spectrum LSF, IBM Spectrum Symphony and IBM Spectrum Scale software delivered as a service. Reduce costs with pay-as-you-go access to hybrid and stand-alone IBM Spectrum Computing clusters and IBM Cloud infrastructure. Enhance user productivity and simplify administration with integrated workload management and transparent access to cloud resources – delivering the same experience as local resources. Accelerate cloud deployments with comprehensive cloud services – a single source for end-to-end support and access to HPC experts. Eliminate the skills barrier for high-performance computing.